Traversing a 105km section of the 1200km-long Heysen Trail, this event takes in rolling farmland, sandy forests, rocky hillsides and lots lots more. The views of this race run through magnificent conservation parks, with the backdrop of gum trees, abundant wildlife and wide open spaces making this a truly Australian experience. Runners are tested over all sorts of surfaces and need to be prepared to use some self-navigation where parts of the trail are not obvious – watch out Brendan Davies! 🙂 As day becomes night they are rewarded with a run to the finish through the whispering pine trees of the Kuitpo Forest plantations. So who’s racing in this one? Brendan Davies, on speed alone, looks like a no-brainier for first. However it’s his first time at this event and if you were going to back someone else with more route knowledge, Luke McLean who was second last year is back to race, as is third place-getter from last year Howard Norton. Two dark horses to look out for are Dion Byas and David Turnbull. Dion is on a roll having just been the first local home at the recent Yurrebilla, David has broken all his lifetime PBs from 1km to 56km this year and is in good form according to the locals in the know. Seventh overall at Yurrebilla means he could sneak a podium at this longer event. In the ladies, Isobel Bespalov will be up there in the placings, but again for local knowledge you can’t go past last year’s winner Hayley Teale. Hayley has had an outstanding running year, taking out the recent You Yangs 80km and 2nd at the Maroondah Dam 50km, 4mins behind Kellie Emmerson. Jo Kruk and Alison Wood (both podium finishers last year) are also back and are very likely contenders too. This time round we’ll start with the ladies, and there are some standout names that catch the eye. NSW gal, Joanne Tremonti looks to be a woman on the rise having gone sub 9 hours at Comrades this year, along with a top ten in the Canberra 50km road champs too. Felicity Copp will be hot on her heels and has ‘podiumed’ at the Tan 100km every year for the last four years in some fairly respectable times, as well as finishing in the top ten of the Two Bays 56kms for the last few years too. Queensland runner and Glasshouse Mountains regular, Mallani Moloney lines up too and based on her results this year will be probably lining up to run a sub 10hr 100km for this race. Finally, Kerri Hodge makes up one of four or five women who could end up winning this one and seems to specialise on the road / fatter surfaces. She won the recent Glasshouse 50kms in a good time of 4.5hrs and also ran a 9.5hr Gold Coast 100kms too. She could just take this one out. In the mens race, one name really stands out like a sore thumb when you look at his results this year and that’s Dion Finocchiaro, although this is his first time having a crack at the 100km distance. 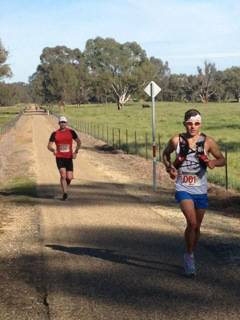 He does however have the form to boot too, winning the Tan 50kms in 3hrs 24mins recently. That type of form screams a sub 8 100kms at Ned Kelly, possibly a 7.5hr one if he paces it right. But people like John Keats and Malcolm Gamble won’t let him have it all his own way if the pace is too hot early on. John recently won the mens Adelaide 24hr race, while Mal Gamble is a veteran and stalwart of this type of racing. Mal races a lot and sometimes it doesn’t always come off, but when he’s on form, he’s a guy that can certainly take this one out. He’s already recorded a 122km 12hr this year, as well as just missing the podium at the Tan 50kms behind Dion. Jason Dunn is another regular 100km road specialist that it seems forever hits a consistent 8.5hrs for most of his 100kms runs, and will be there or therabouts as will Brett Easton. Wherever you’re running this weekend – Enjoy! not interested in the NKC 50km? Sorry Trevor, this is a part-time gig and time was extremely tight – other demands. Only just managed to get this out. Apologies, hopefully I’ll have more time next time round.